Hermes Eau des Merveilles is designed specifically for women energetic. Hermes Eau des Merveilles 100ml. Eau De Toilette is designed specifically for women energetic, passionate art that know what they want from life. Perfume composition was made of violet notes mixed with pepper and cedar will load with positive energy every time. Base perfume was created in flavors and fir vetvier you to rate playful fragrance. 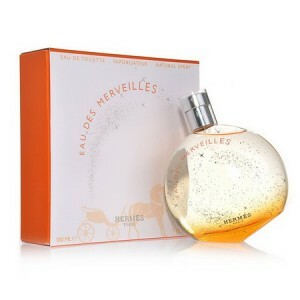 Hermes Eau des Merveilles creates a magical and fascinating world that will impress every day. Dare to try a perfume dream Hermes Eau des Merveilles! Whimsical fragrance from Hermes, called Eau des Merveilles (French for "magic water"), described as amazing, refreshing and magical. Perfume Eau des Merveilles inspired ambergris - a rare substance produced by whales and consisting mainly of claw cuttlefish. Amber for many years, appreciated for its sweet and pleasantly fragrant smell and the ability to capture the flavor. "For me, amber - magic material - says perfumer Ralf Schwieger of Givaudan, who created this fragrance with Nathalie Feisthauer. - Ambergris has so many facets, this amber, wood, dark, salty-sweet blend with notes of tobacco and ink. My idea was to reflect this diversity of flavor. " Perfume Eau des Merveilles consists of the notes ale, orange, Italian lemon, Indonesian pepper and pink pepper. Naturally, there is also "amber chord" in combination with colored wood (oak, cedar, vetiver, Peruvian balsam, incense Siamese). Unlike most flavors are traditionally ambery woody notes and take only the "base" in Eau des Merveilles are present everywhere. However, this perfume almost no floral shades, a rarity for women's fragrance. Serge Mansau created orange bottle, like a toy. This almost completely round bottle having three flat bottom surface in order that it can be put on a table or put on the rear wall. The back side of the vial is strewn with silver stars that evokes associations with magic.